We are delighted to welcome 13 year old Lou Warnett as our guest soloist to perform the Ravel Piano Concerto in G.
Lou won the Concerto prize at the acclaimed Kent International Piano Courses competition for the second year running. He was their youngest participant. As part of the prize he was offered the chance to perform his concerto with a full orchestra - us! Lou was born in France to an English father and French mother. He was fascinated by piano music from an early age despite being born into a family of non-musicians. 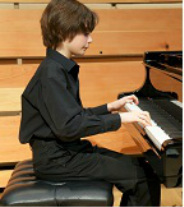 He started his piano studies at the age of 4 and began tuition with Lora Dimitrova in January 2009. Lou attained his Grade 8 ABRSM Certificate with Distinction aged 10. He currently attends Sevenoaks School as a Major Music Scholar. Last year Lou played on stage with Lang Lang at the Royal Festival Hall as part of the" Lang Lang Inspires" Project and also performed with the Southampton Charity Symphony Orchestra, playing Haydn's Concerto in D.
Schubert's Symphony No. 8 in B minor was started in 1822 but left with only two movements known to be complete, even though Schubert would live for another six years. One possible reason for Schubert's leaving the symphony incomplete is the predominance of the same meter (three-in-a-bar). The first movement is in 3/4, the second in 3/8 and the third (an incomplete scherzo) also in 3/4. Three consecutive movements in exactly the same meter rarely occur in the symphonies, sonatas or chamber works of the great Viennese composers (one notable exception being Haydn's Farewell Symphony). In 1823, the Graz Music Society gave Schubert an honorary diploma. He felt obliged to dedicate a symphony to them in return, and provided to his friend Anselm Huttenbrenner, who was a representative of the society, a score he had written in 1822. This much is known. The fact that Hüttenbrenner did not have the piece performed, or even make the society aware he had the manuscript, is curious and has led to various theories. Was he given an incomplete score by Schubert and was waiting for the remainder to be provided before saying anything? If so, he waited in vain for the remaining five years of Schubert's life. After Schubert died in 1828, why did Hüttenbrenner not then make the existence of the manuscript known? Do the torn pages suggest he had somehow damaged the piece and managed to lose, or even destroy the last two movements? Was guilt the reason he said nothing about the work's existence for 37 years after Schubert died? Old age and approaching death seem to have been a factor in Hüttenbrenner finally revealing the work. This happened in 1865, when he was 76 (he was to die three years later). He showed it to the conductor Johann von Herbeck, who conducted the extant two movements on 17 December 1865 in Vienna, adding the last movement of Schubert's 3rd Symphony as the finale. This performance was met with great enthusiasm by the audience. The score of the symphony was not published until after 1867. 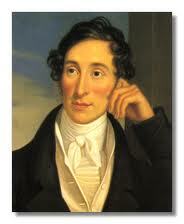 Weber composed the Jubel Overture in August 1818, and it exists as an independent concerto work. The Jubel Overture is a relatively short work that resembles some of the other concert overtures he composed in his career. The work begins with a solemn, chordal introduction in which Weber establishes clearly the tonality. He then proceeds to a faster section full of the scalar passages and other figures typical of his mature music. Near the end of the Jubel Overture, Weber quotes the tune "God Save the King" (which was the German national anthem until 1922) in a broad manner that recalls the opening of the overture..
Edward German - Three Dances "Nell Gwyn"
_German began to build a career as a composer in the mid-1880s, writing serious music as well as light opera. In 1888, he became music director of the Globe Theatre in London, providing popular incidental music for many of its productions. The Three dances "Nell Gywn" was composed for the production of the play "English Nell" at the Prince of Wales Theatre.